From the top of Monjardin, you can see the different regions along Navarra State. Accordance to the different areas, the Navarra Wine DO has 5 subzones to grow grapes: Tierra Estella, Valdizarbe, Navarra Media, la Ribera Alta y Baja. Our location is very strategic, we are in the Northwest limit and also in the foothills of Monjardin Mountain. This cool climate is excellent to grow our Chardonnay. Over 500 mtrs, we have our Azqueta Vineyard where we obtain our Chardonnay fermentado en barrica. At the same level, our Vineyard 'La Rellanada' gives our Chardonnay Reserva. Along the Camino de Santiago pilgrimage, we have the El Cerezo Vineyard, named after the Cherry tree, that gives our Chardonnay Unoaked. Also, in this vineyard we have 4 Ha of Pinot Noir that is of the very few of Spain. At Campanaldia Valley, 5 Km from the winery, located at an altitude of between 400 to 610 metres is where we grow the red grapes like Tempranillo, Merlot y Cabernet Sauvignon. THis area is warmer and is very good to fully developed the red grapes that need a longer time to ripe its tannins. Our vineyard 'Los Carasoles' is one of the oldest in this valley. Around Olite, we have our oldest vineyard more than 70 years old Garnacha that still gives delicate but extraordinay grapes. 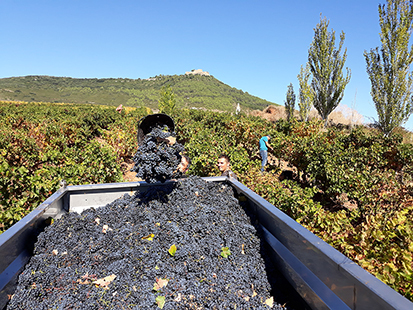 Also in this area, we have Cabernet Sauvignon and Tempranillo to obtain Rosado de Lagrima as it is traditional in Navarra.